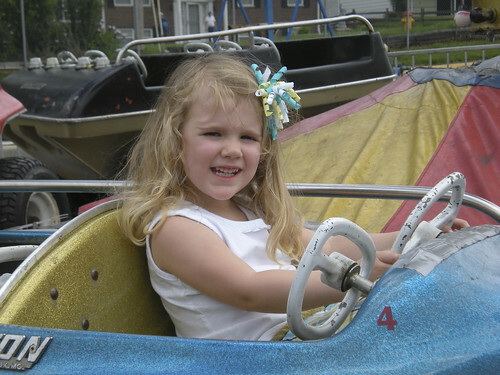 Ella rode her first solo ride at the Spirit Festival 2 years ago, and she’s been loving going on the rides ever since! This year’s rides were…less than stellar. Apparently, the school district changed carnival companies, and it definitely showed in the ride quality. There were only about 5 kiddie rides. 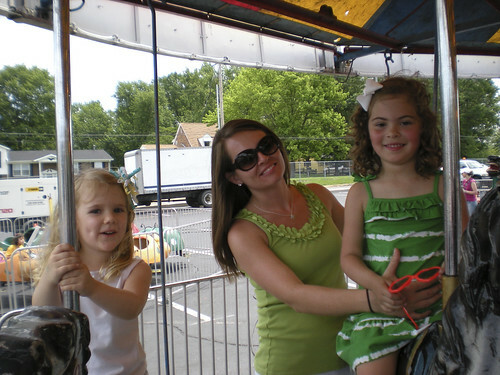 Only half of the horses on the carousel of nausea went up & down, and the other rides were, literally, falling apart, as one patron noted that her son was able to take the steering wheel off of one ride. Nonetheless, Ella had fun, especially with her friends! Then we met up with Delaney for more fun! 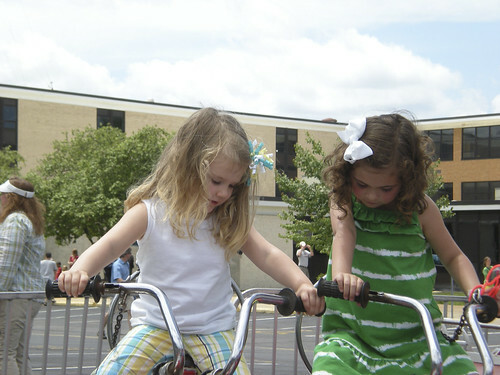 The day turned out to be quite hot, but Ella had a great time with her friends. Hopefully, she’ll have fun for many years to come as a Flyer! 1. Part of me is KIND OF jealous of Michelle Duggar. Yes, I think that having 20 kids is absolutely ridiculous, unnecessary, bad for the earth, financially impossible & definitely not the best way to raise children with individualized attention. But I really love being pregnant & giving birth. Why? I have no idea. There are parts of both that are terribly miserable. I guess what I really love about it is the excitement of finding out that you’re pregnant, then getting to hear the baby’s fast little heartbeat, watching them get bigger in progressive ultrasounds, feeling the increasingly stronger (then subsequently squished) kicks & flips, noticing baby hiccups. I love the big round belly, even though it can be cumbersome & weary. I love maternity clothes because they are usually really comfortable. I love labor & delivery because it is such a special time to focus on you & the little person you are bringing into the world. In my experience, labor & delivery have put me into my own little world. I know that my family might be complete, so I might be finished with this process. I’m also guessing that as I get older, these feelings will probably pass. But every once in a while, I get jealous that Michelle Duggar has gotten to experience that 20 times because it is so special. 2. I really love strollers. We have 3 (4 if you count the bike trailer I just got that can also be used as a stroller). I don’t really WANT any more strollers, but I always aspire to trade in & change up. For me, it’s not really about getting the most expensive stroller (there are some crazy expensive ones! ), but I love to see what the new ones can do! How they are different, how they can be used. I adore my phil & ted’s sport (though the sport model is discontinued) and it has been super useful. But I’m always intrigued by new strollers, too. We plan on purging our travel system stroller (Chicco Cortina) when Audrey outgrows the infant seat. The car seat will expire before we would have any more children, so we decided to get rid of it as a set (stroller, car seat, 2 bases) so that someone else can use it. How many strollers is really too many? 3. I’m sharpie obsessed. I don’t know why I love those markers so much, but the rainbow packs of them are so exciting. I try to avoid the office supply area of Target just so that I don’t have to stare at them. 5. I remember many events by song. Either a song that was playing on the radio, a song that was meaningful for a specific relationship, a song that I related to during that time…several reasons. One of my favorite memories of my friend Jacinda was driving to her house, listening to “She Drives Me Crazy” by the Fine Young Cannibals. We laughed for months because she thought the lyrics were “She drives me crazy/ooo oooo/like long white elves/ooo oooo”. Of course, I have songs (sometimes one, sometimes many) that remind me of broken hearts, but I think of them fondly now. It’s also funny how these reminders help me remember dates. “Oh, that was freshman year of high school because such & such song was out then”. My current obsession, though it has no ties to anything specific, is Adele. I know there are other things that will come to me, probably as I hide out in my basement for the rest of the spring, waiting out the tornadoes. Apparently, rather than cleaning our house for the past couple of years, we’ve been pushing dirt and dog hair around. I knew our vacuum was pretty crappy (even though it *claims* to be a “pet hair eraser”), but I didn’t know just how crappy it was until we got a new one. 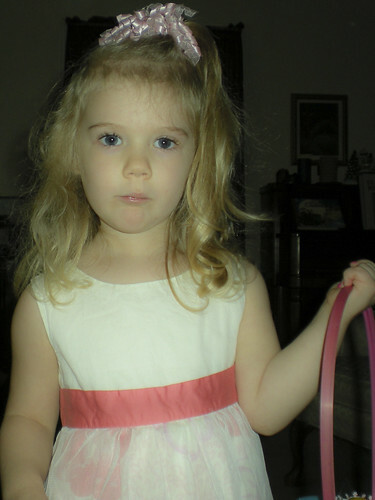 Ella was diagnosed with pet allergies in November of 2010. We knew she was allergic to eggs & peanuts as well as a mild asthma, and we had suspicions that she had environmental allergies. 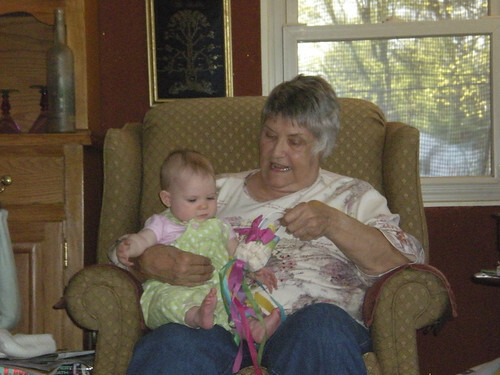 For most of last summer, she dealt with a runny nose and, with any increased activity, a pretty nasty cough. 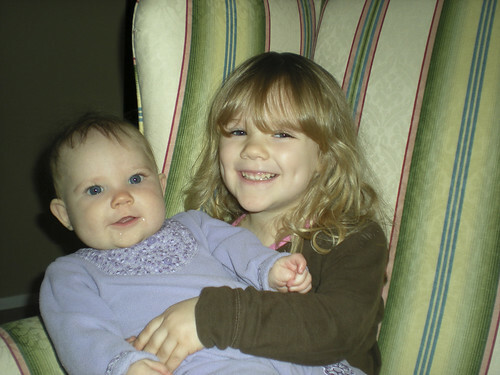 When we met with the pediatric allergist at Children’s Hospital in November, we learned that Ella was allergic to dogs, cats, cat pelt, mice & a specific mold. Great. We HAVE a dog already! We were told that we didn’t need to get rid of her, just try to keep her out of Ella’s sleeping areas & keep as much dog hair out of the air as possible. We changed our furnace filter to a higher quality, allergen reducing one, put up a swinging gate so that the dog cannot get to the bedrooms & vacuumed more often (say, 2-3 times a week). Even though Ella’s new nose spray was helping with the runny nose, she would still cough a lot at night and cough a whole lot if she ever played downstairs in her play area. We were avoiding having her play there since it was affecting her so badly. She would even be more likely to have breathing problems outside of the house because she was already coughing. About 6 weeks ago, when Audrey started really wanting to roll around on her own, we realized that our vacuum was worse than we thought. I could vacuum a room, put Audrey down to play & she’d still immediately be covered in dog hair. Her hands, her toes, her clothes….gross. Obviously, that could not be good for Ella, so we went on a vacuum hunt. I researched, read reviews, checked prices, read more reviews. Initially, we had settled on a Hoover Tempo Widepath. Luckily, I had lots of trouble finding it in stores. As I did more research (since I couldn’t find that vacuum), I decided that it was not the best vacuum for us. Several reviews claimed points that would be quite detrimental to our goal of eliminating as much dog hair as possible from our lives. After reading many stellar reviews of the Hoover Platinum Bagged Upright, even though it was pricier, we made a decision to purchase. Our carpets, and Ella’s lungs, have never been cleaner! I vacuumed our living room, ran my fingers through the carpet, even scratching it, and NO DOG HAIR! It was amazing. 1. There are no attachments. It comes with a separate, smaller canister vacuum with a hose & attachments. I actually find this to be much easier to deal with because I can carry it around, use the extender to get fans, curtains, baseboards, etc. without having to bend over! 2. It is bagged, which means buying bags. And the bags for this vacuum are not cheap. BUT, in our situation, having a bagged vacuum, especially with self-sealing bags, this is much better than bagless. We don’t have the dust/hair flying around the house as we empty the container anymore. And the vacuum keeps it’s suction power much longer. It has been amazing to make such a small change and have it be so monumental for Ella. She has been coughing very little, if at all. She can play anywhere in the house without any problems. Audrey can roll around without being covered in hair. Life is, once again, beautiful. 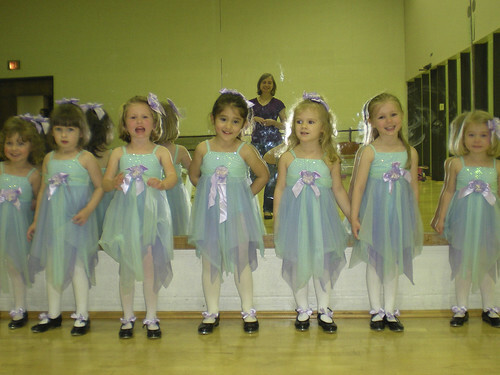 Ella had her first dance recital on April 30. 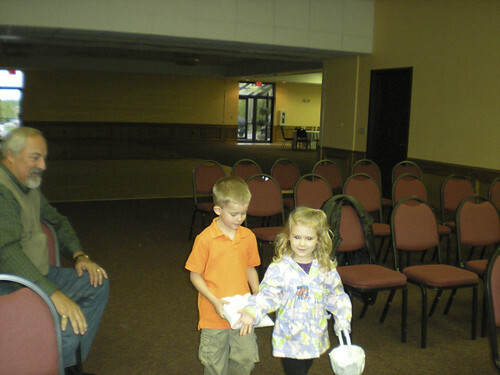 Another mom & I were the helpers for the dress rehearsal (where I took this picture) & it was so cute & a lot of fun! Even though Ella was a bit distracted by the numbers on the stage, the lights & the people, she & her classmates did a great job. We are so proud of her! 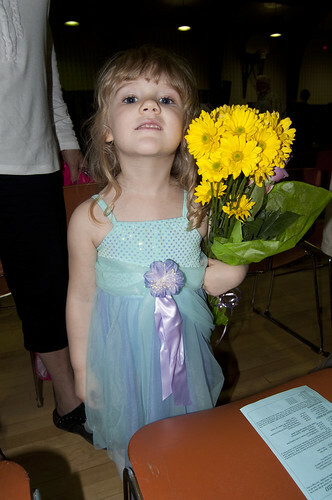 She even got flowers from grandma & grandpa & mom & dad after the recital was over. Audrey & I have been venturing into new foods for her to eat. Usually, she will dislike a new food at first. I will often have to mix a new food with one she already likes so that she’ll slowly get accustomed to eating it. 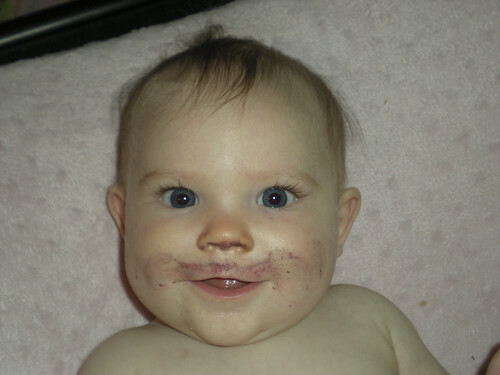 She was not a big fan of the blueberry applesauce at first, but, as you can see, she grew to love it! This week, we’re trying spinach, carrots & a peach/banana mix! 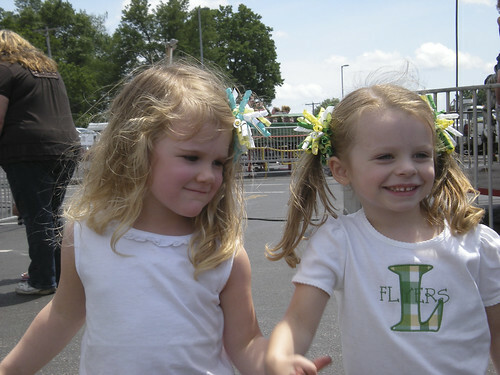 Ella & Audrey are such sweet sisters! They love each other so much. No one makes Audrey laugh quite like Ella. And Audrey always makes Ella smile, even when she’s grumpy. I couldn’t have asked for better girls! My brother Kerry & his now wife Amber were married on Thursday, April 28, 2011! It was a beautiful, though windy, day. Dave was a groomsman & Ella was the flower girl. She did a wonderful job both at rehearsal (below) & at the wedding. We are all jealous of Kerry & Amber’s time in Hawaii right now, but we feel so lucky to welcome such a great woman into our family! Congratulations Kerry & Amber! Easter was a very busy day! My dad, Dave & I played instruments in both church services & my mom hosted Easter this year. In between services, Ella went egg hunting at grandma’s house (the bunny didn’t stop at our house) & I could only get pictures of Ella eating jelly beans! Typical. After the second service, our family ate a fabulous lunch at my parents’ house. Both girls had gone without naps, leading to some easy mood swings. Ella was happily eating chocolate pie until she realized her piece was too small. She went into a tantrum, threw herself onto my lap, which contained cherry pie, & spread cherry pie all over her forehead & hair. The ensuing cries of “I want to go home!” and “Don’t laugh at me!” were, undoubtedly, met with more laughter. Everything eventually calmed down, but candy + a long day + no naps + food mishap = time to go home! After I finished my cherry pie, of course! 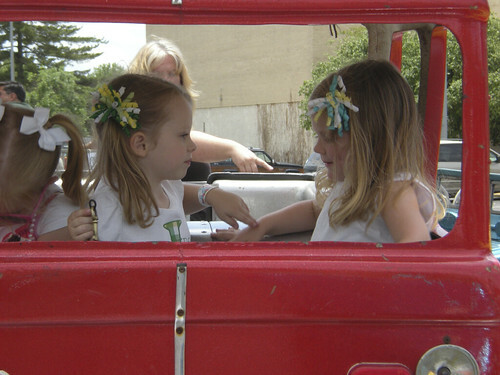 Ella & Audrey love to go to GG’s house! On one of our rare sunny, warm days (a day off from the monsoon season we’ve been having! 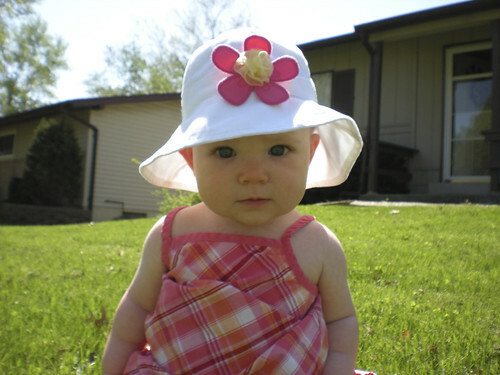 ), Audrey got to sit in the grass for the first time. She was surprisingly happy with it! She was eager to touch it & was quite content to just sit & observe life on the grass. Ella’s first encounter with grass was met with screams. It’s nice to have a more laid back baby this time around! Take Me Out to the Ball Game from David Morley on Vimeo. Post a comment or send me a message for the password!